There’s a mountain of problems haunting the U.S. healthcare industry that run the gamut from outdated payment models and frustrating tech to a patient population plagued with chronic preventable disease. It’s an ostensibly never-ending list, and woven deeply into the fabric of each one of these issues is a single, pervasive notion: The physicians tasked with whittling down this mountain of problems are burned out. Lately, no trend has permeated the discourse around medicine’s triumphs and challenges quite like physician burnout. Most of the hundreds of doctors I’ve interviewed acknowledge its detrimental existence, and online, where venting is ubiquitous, you can’t make it more than a few dozen tweets without hearing about burnout or seeing it in action. Physician burnout is the topic of thousands of physician-authored op-eds, blog posts and conference presentations. And recently, the literature is making strides toward catching up and lending credence to the conversation: A new systematic review and meta-analysis in JAMA Internal Medicine has found that physician burnout is associated with suboptimal patient care, and that physicians with burnout are twice as likely to be involved in patient safety incidents, twice as likely to deliver sub-optimal care to patients owing to low professionalism and three times more likely to receive low satisfaction ratings from their patients. High depersonalization in physicians was particularly indicative that patient care was at risk. It was the factor most strongly associated with reduced prof essionalism, patient safety incidents and lower patient satisfaction, which suggests that physician burnout is perceptible to patients, according to the authors. Resident and early-career physicians reported much stronger links between burnout and low professionalism compared with studies of middle- and late-career physicians. “It is likely that burnout signs among residents and early-career physicians have detrimental associations with their work satisfaction, professional values and integrity. Healthcare organizations have a duty to support physicians in the demanding transition from training to professional life,” wrote the study’s authors, led by Maria Panagioti, Ph.D., of the University of Manchester. Is it any wonder that overstressed, overburdened, overworked physicians are performing poorly? Of course not! The wonder (or the blunder, to give it a more apt name) is that we allow it to continue happening. Think about how delicately we coddle and track our professional athletes so that their performance is optimized for game time. Their meals, training schedules, sleeping patterns, transportation and tools are all managed for them. Then, on game day, when they show the slightest signs of fatigue, they’re pulled to the sidelines and supported by their teammates. Now think about a physician’s workflow. Who can count the number of times they’ve listened to their physician peers complain of not having enough time during a workday to eat a meal, or that they could hardly keep their eyes open during the 23rd hour of their shift? There’s also the dread that comes with knowing that each hour of practice might result in several hours of matching paperwork, data entry and administrative tasks. Support is scarce. On one hand, athlete burnout would mean a poor fan experience and a PR nightmare for the leagues that hire them. As it turns out, the same is true for health systems — the patient experience is suboptimal, and hospital systems are publicly struggling (and, in some cases, publicly neglecting) to tame the burnout beast, even though it costs them untold billions, according to the review. One would think that such a gaping hole in the efficiency of healthcare delivery would become the Holy Grail of operations optimization and revenue growth for hospital executives. And while we can’t be sure of what’s atop the to-do lists of every C-suite, the evidence suggests that it’s probably not the wellbeing of their physician workforces, yet. Previous studies have suggested that physician burnout gets worse every year. By many estimates, physician burnout is the new normal. One physician network reported that 76 percent of physicians suffer from sleep loss due to stress. Mayo Clinic surveys show that self-reported burnout affects most physicians and continues to grow steadily, year over year. With burnout comes increasingly common suicidal ideation among physicians. More than 400 take their own lives every year — an especially disconcerting trend when juxtaposed with the looming physician shortage. Moreover, in an editorial response to Panagioti’s study, Mark Linzer, MD, of the University of Minnesota, wrote that executives often ask him the same questions about burnout: “What should we do? What will it cost? How will this affect productivity, quality and physician turnover?” These questions underpin the notion that executives are not implementing sufficient measures to reduce burnout in the present — and that they are not convinced of the value of implementing strategies to reduce burnout in the future. Which workflow redesigns best improve efficiency and reduce burnout? What aspects of the electronic medical record can be addressed to lower stress? How can we reengineer workplaces for less chaos and burnout? What work condition modifications can address burnout in trainees and early-career clinicians? 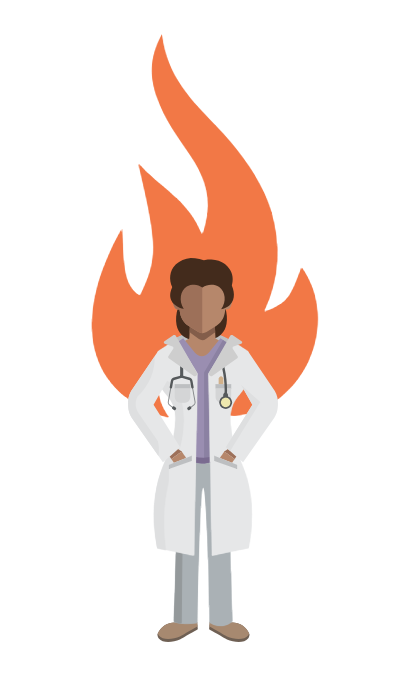 What efforts can narrow the gender gap and reduce burnout among female clinicians? Does burnout reduction improve productivity, quality, safety and patient satisfaction? What interventions can reduce burnout in both support staff and clinicians? Will work condition changes lead to more trainee interest in primary care? Which policy or regulatory changes can improve clinician satisfaction? In the absence of a clear understanding of burnout’s causes and effects, it’s tough to determine the best path forward. What’s worse, “answering these questions is challenged by there being few funders who have entered this field in a substantive manner,” Linzer wrote. In other words, we aren’t investing enough time, money and research into understanding burnout, especially given that we have a better idea of what it’s costing us thanks to this systematic review and meta-analysis. On another level, it’s just the decent thing to do.